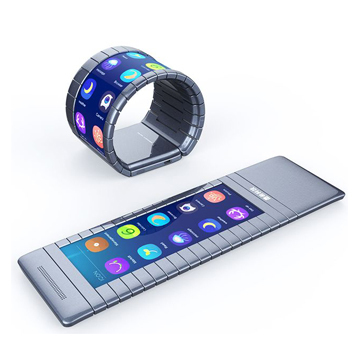 Companies have been dreaming about flexible displays in smartphones for years. Samsung has been successful with curved screens in its Edge phones, which offer curved glass on the edges that can be used for special features. However, this is hardly the same as having a flexible phone with a screen that bends with the device. Now, a company from Chongqing, China called Moxi Group is offering just that. Unlike Samsung's phones, Moxi's handset uses E Ink displays instead of AMOLED, which is also known for its flexible properties. The phone design in an image provided by Moxi shows a phone that rolls up into a watch. If the device is meant to double as a smart watch, the power-efficient E Ink display makes sense. However, some consumers might balk at buying a smartphone that only has a black and white display. It should be noted that E Ink now has color electrophoretic displays, but the technology is in the early stages and is primarily meant for use in large outdoor displays. The phone also does not come cheap. It will retail for 5,000 yuan, or about $760, which is firmly in iPhone’s territory in the US. Even so, the handset might not make it that far. For now, Moxi is only planning a China release. If the device is well received, the company might expand to other markets. Other mobile phone vendors also want flexible displays, but they are looking at AMOLED. Digitimes reported that smartphone and tablet vendors are requesting flexible screens from suppliers. There are still technological hurdles to overcome, but vendors want to start working on these devices next year. For smartphones and tablets, they want foldable displays, but for larger devices such as notebook PCs and monitors, sellers want rollable ones. The biggest hindrance for flexible displays right now is the price. AMOLED displays cost more than LCDs, which is used in many inexpensive smartphones, especially ones coming from China makers. It looks like Apple will be including OLED in the next iPhone. Thismight provide a boost in production and help bring down prices in the long run. At that point, more China companies will no doubt enter the market for AMOLED and flexible handsets.